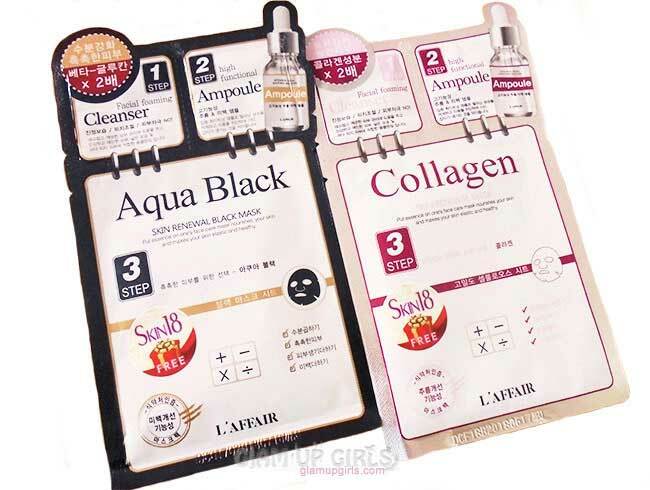 In today's post i am going to share two more sheet masks from Skin18 which are by Korean brand L'affair. These masks definitely led me to try more of Korean products and i would say i am pleased to try them. The good thing about these masks are they have two extra products apart from sheet mask including cleanser and ampoule. Let me tell you what made them on my most favorite masks list. Niacinamide ingredient to help make your skin color brighter, rice extracts ingredients to help improve skin texture. 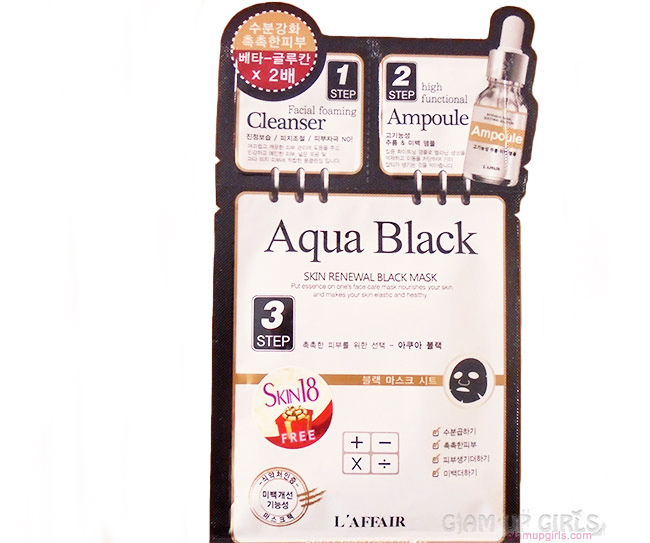 Four species of black complex to protect the gives tired skin hydration cultivate vitality enables highly effective and makes a moist. Tip: Most effective way for a visual result will be using product regularly for 4 weeks as it is the period of time that considered for a skin turnover cycle. Main features: Moisturizing, whitening, shrink pores, pulling compact, skin moisturizing. This package have one skin renewal mask, facial foaming cleanser with makeup remover and a high functional ampoule to use before the mask process. These masks are a total solution for a home facial where in step 1 you can use foam cleanser to remove makeup or other impurities from skin. In step 2 apply ampoule on face and massage in outward strokes. In step 3 apply mask on face for 20 minutes. The masks sheet are made of thick cotton fabric with proper places cut for nose, eyes and lips. The good thing about the cuts are they are close and not very large like some other thin sheet masks. 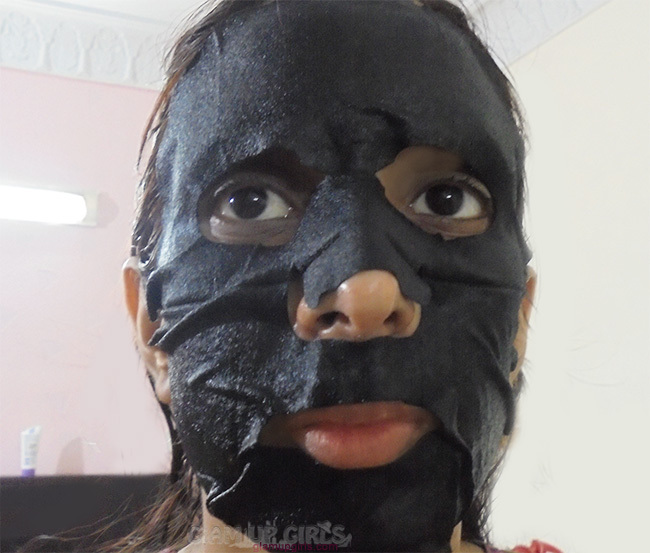 After application the mask start bit drying around very dry parts of your face like around mouth and nose in my case. Both masks have amazing smell which is not overpowering and feels very refreshing. After removing i pat the essence into skin which absorbed quickly. This mask leaves my skin feeling amazing, it looks hydrating, glowing and healthy. The plump feeling stays with you very long and feels very good. This 3 step routine can be used before any event for glowing skin or after tiring day for deep cleansing, relaxing and retaining moisture.